The article examines the Fennophile cultural movement which took place at the turn of the 18th century. The Fennophile cultural movement is one of the ideological sources of the Fennoman movement, a Finnish national movement which appeared in the 19th century when Finland became a part of the Russian Empire. This study reveals the difference between the terms “Fennophile cultural movement” and “Fennoman movement” which Russian and Finnish scientists often describe as synonyms. The main objectives of this study are to examine the Fennophile cultural movement and to analyze the views of its leader Daniel Juslenius, paying attention to his work “The old and new Turku”. 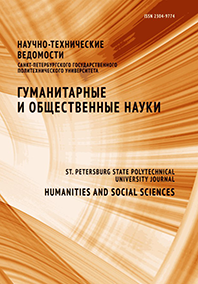 Such general scientific methods as analysis and synthesis, description and explanation, ascent from the abstract to the specific and the dialectic approach were used in the study. A conclusion is drawn about the influence of the Fennophile cultural movement on the Fennoman movement of the 19th century.